Here are the textbooks and exams you should use to prepare for your promotion to lieutenant in a police or sheriff's department. Exams with over 500 questions, from over 100 great textbooks, are now available. What are the best textbooks to study to prepare for your police lieutenant exam? That depends on whether you are working for a large agency (150+ sworn) or a medium agency (50 - 150 sworn) or a small agency (under 50 sworn). You will also need to use your judgment and knowledge of how the rank of lieutenant is considered and structured in your specific agency; is it considered middle-management, top management, or if in a very small agency, say 15 officers or less, as an executive manager, i.e. assistant or deputy chief? The biggest difference being, of course, as an executive you need to be able to step in to lead your agency at any moment, so the demands in education are much higher. There are 11 textbooks that stand out, all of which I have written numerous exams from for the lieutenant rank. Any of them can be used in a small, medium or large agency, since they each contain a comprehensive summary of supervisory, management, administration and leadership principles. My BEST piece of advice on this page? If you believe you are heading to a police lieutenant exam any time in the future, you need to own and constantly read the material in the below 11 textbooks. They are listed below not in any particular order. Management and Supervision of Law Enforcement Personnel - Lombardo and Schroeder. From me; Not to be confused with a similar title described below. People are always getting the two mixed up. This is a very nuts-and-bolts direct and to the point book that is easy to read and study, and the presentation is in the format where you can take this supervisory and management knowledge and run with it without hesitation. This great textbook makes for a very difficult police lieutenant exam. Effective Police Supervision - More and Miller - now in its 8th edition. From me; Excellent, comprehensive textbook. I know it doesn't say management or leadership in the title, but believe me this exhaustive 600+ page work covers it all. I know many agencies (especially medium to large agencies) that choose it for Lt as well as Sgt promotion examinations. Management and Supervision in Law Enforcement - Hess and Orthmann - From me; I like this book for writing promotion exams and do it all the time, and have written difficult and challenging exams way back to the third edition. Now in it's 7th edition. This textbook has also been used in the New Jersey statewide civil service promotion exam for Lt.
Police Patrol Operations and Management - Hale - From me; Since most new police promotions to sergeant and also lieutenant first wind up in patrol, I see this book a lot for promotional exams. It is a good, solid choice that is an excellent foundation for patrol knowledge. From the publisher; Based upon a practical application of theory with the “how-to” of “real world” policing, this book details the core functions of a police agency—covering patrol operations, goals, and strategies. It combines management theory with case study examples taken from small police departments. KEY TOPICS Specific chapter topics discuss police patrol hazards, community-oriented policing, patrol force staffing and deployment, special issues in patrol operations, and upgrading patrol effectiveness. For police practitioners, field supervisors, and middle managers. Visit us for the Police Patrol Operations and Management exam, test questions, study guide and flashcards. Police Administration - Wilson, Fyfe, Greene, and Walsh 5th Edition 1997 - From me; YES - this is an old textbook. But it is still used in mid-management exams, for a good and valid reason. One of its authors and contributors is O.W. Wilson, AND almost all of the material is still pertinent to mid, upper and executive management positions today. From the publisher; Perhaps no other book in policing has captured more admiration and market share than O.W. Wilson's "Police Administration". Now Wilson's text has been revised by three top scholars in the field. This long awaited revision combines the nuts and bolts approach of the original with an up-to-date theoretical and policy perspective that makes it accessible to students and practitioners alike. Visit us for the Police Administration - Wilson exam, test questions, study guide and flashcards. The Police Manager - Green, Lynch and Lynch - From me; This is a widely used textbook for police exams for Lt. and above, and it is one of my two or three favorites. It would be suitable for an upper-management exam for a small or medium agency. From the publisher; The Police Manager gives practical, field-tested guidance to students and professionals who aspire to leadership roles in law enforcement, providing a comprehensive explanation of issues and challenges that they will face as police managers. The book is divided into four parts, covering historical and philosophical underpinnings, behavioral aspects of police management, functional aspects of police management, and major issues in modern police work. Visit us for The Police Manager exam, test questions, study guide and flashcards. Local Government Police Management - 4th Edition by ICMA Press. - From me; YES - this is another old textbook (2003). But it also is still widely used in lieutenant and captain exams, also for a good and valid reason. It is a compendium from a great variety of management and leadership sources, making it unique in presenting solid, proven material from these numerous sources, all of which are clearly cited. From the publisher; This brand new revision of ICMA’s classic police management reference includes new coverage of such cutting-edge issues as terrorism and community security, leadership and managing change, setting standards and measuring performance, information management and technological innovations, and strengthening police-community partnerships. It provides information for local government administrators and police executives on managing patrol, prevention, investigations, and transportation services; the special challenges of local drug control and criminal organizations; internal functions such as human resources, planning, and facilities design; and linkages with other governmental and nongovernmental agencies and service providers, including crime laboratories. The volume emphasizes the importance of personal leadership by the chief in facilitating change, setting standards, and fostering integrity. Visit us for the Local Government Police Management exam, test questions, study guide and flashcards. Proactive Police Management - Thibault, Lynch and McBride - From me; This is widely used text for police Lt. exams, and is one of my favorites. Material is very cutting-edge and challenges many conventions and norms in the field. Well documented and cited. I can honestly say I know many candidates that very much enjoyed reading this textbook for their promotion exams. From the publisher; It emphasizes a contemporary and proactive approach to police management. Various police management styles are addressed throughout, from traditional scientific management to the behavioral/systems approach to the human relations approach. Its chapters take a realistic look at operational problems that can occur within a police department and how a consultative, proactive management style can help solve and resolve them. Fully updated in this edition, its goal is to reveal how proactive management techniques and new technology are revolutionizing police management today. Visit us for the Proactive Police Management exam, test questions, study guide and flashcards. Promotional Exams for any or all of these great textbooks can be taken by you to use as study material within the Advanced Police Promotional Testing Course at PoliceCareer.com. You can also practice with a police management sample in-basket assessment. 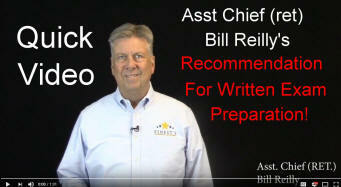 Are YOU prepared to respond to these police lieutenant oral board questions? "How would YOU describe your knowledge and of police leadership and management?" "What do you feel MOST qualifies you to be promoted into this important department mid-management and leadership position?" "This mid-management position is all about community and leadership. You are leading a team of department supervisors, reporting directly to upper management. Describe in detail your own philosophy of community and problem oriented policing, and how you are prepared to provide leadership in these areas on day one in your new rank." The #1 BEST WAY to Prepare for Your Police Lieutenant Exam? Study the Textbooks! tension between crime fighting and ______________. the modern patrol operation from earlier forms of policing. The "Attributes of a Viable and Dynamic Organization" includes which of the following? Check all that apply. In evaluating intelligence-led policing, what are the two main types of evaluations being used? Most police departments report that the average time from the start of the planning process until construction of the new police facility is completed is about ____________. There is a natural order to the world and there is a natural order to oral board preparation. With rare exceptions, we advance in police positions one step at a time. This series of articles (the first one was “The Sergeant’s Oral Board: Preparing to be #1”) represents the progression of responsibilities that each law enforcement position holds and the corresponding complexities of preparing for an oral board for the next rank. So, if it has been a while since you were successful at your sergeant’s oral board, and you are now preparing for an upcoming lieutenant’s oral board, you may wish to review the Sergeant’s Oral Board article as a foundational reference. Lieutenant Oral Board Question 1 - You need to STAND OUT- so Get Creative!